"We run at times like this because we are runners." - Brendan Minihan Jr, coach of Metairie Park Country Day School, commenting in an article on why he ran a race in the midst of his Gustav evacuation and how a friend of his literally had running save his life in the middle of Katrina. 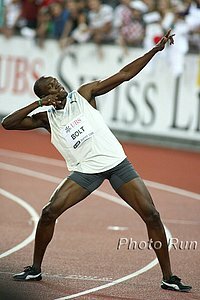 *Lausanne Recap: Powell Runs 2nd-Fastest Legal 100m in History - 9.72! Bolt 19.63! Asbel Kiprop Impresses at 800m and Smokes Olymipc Medallists The men's 100 meters is going to be insane next year as Powell ran a PR. Also remember, the fastest 100 meters ever run in history belongs to Tyson Gay, who ran a wind-aided 9.68 at the US Trials. Powell was obviously thrilled with his PR, "After all my problems this year, it�s great to set a new personal best." In other news, Dayron Robles lost and Asbel Kiprop showed he's got good range as he ran a fine 1:44.71 and smoked the Olympic Champion and bronze medallist in the process. Also LaShawn Merritt broke 44.00 for the 2nd time in his career. In the women's 1,500m, Maryam Yusuf Jamal and American Shannon Rowbury ran the races they wish they had run at the Olympics as they ran 3:59 and 4:01 respectively.